For me here at StoneGable, summer means getting outside and being able to use our porch and patio! This year my porch is taking on a new look! 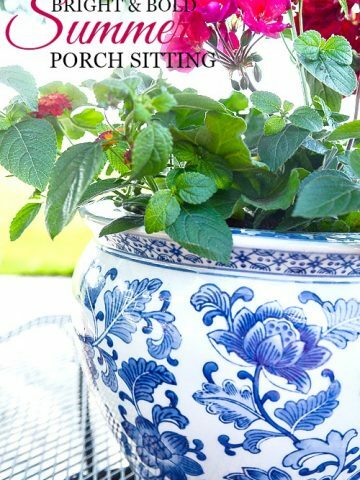 I particularly love “porching”. Have you heard of that before? 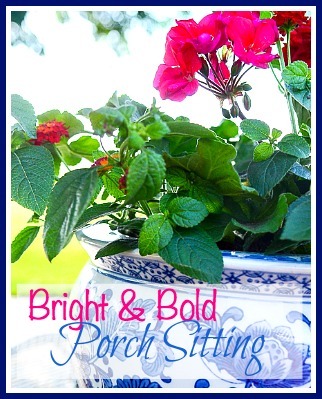 Porching is just a newer name for porch sitting with a certain urban twist. It’s the idea of sitting on the porch and watching the world roll by! I’m giving it a little bit of refinement and suggesting that porching is an upscale way of outdoor living. 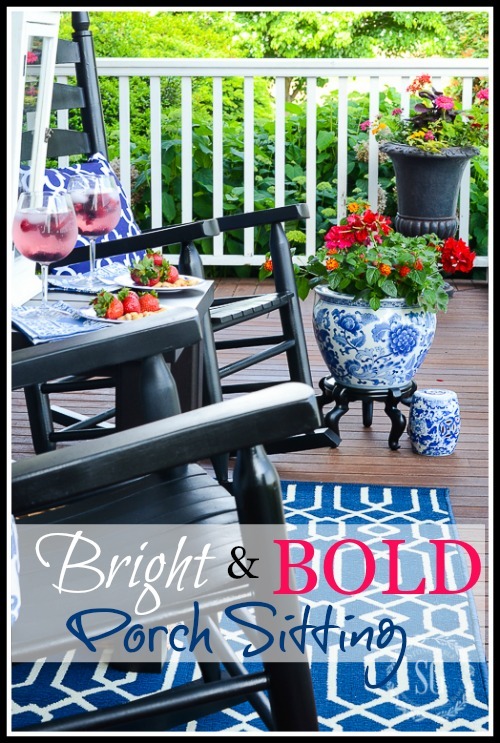 Let’s do some bright and bold porch sitting… oh, I mean porching! You are in for such a treat! 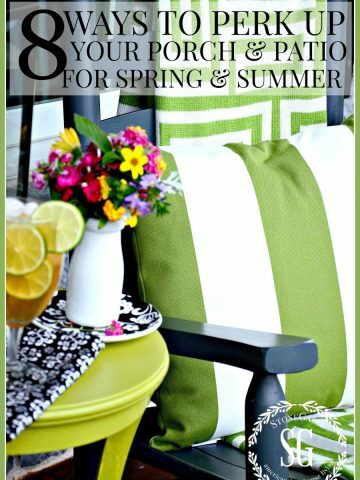 A group of creative bHome bloggers are showing off and sharing their simple summer outdoor spaces! 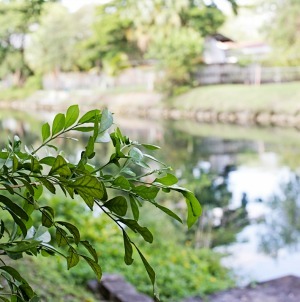 If you like being inspired you will love visiting these talented bloggers! Make sure to check out their posts at the end of this post! 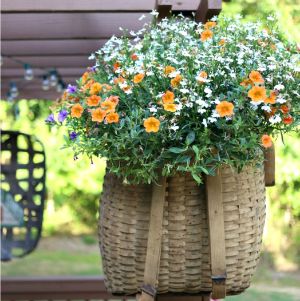 Actually, my front porch has looked like this for a few years and it was in need of a little makeover! 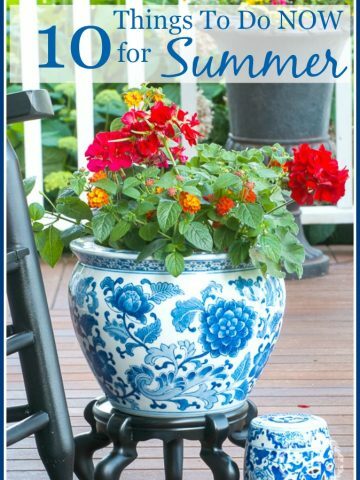 The inspiration for this year’s porch was a big blue and white fishbowl planter that was kicking around in my basement and bright red and pink geraniums. 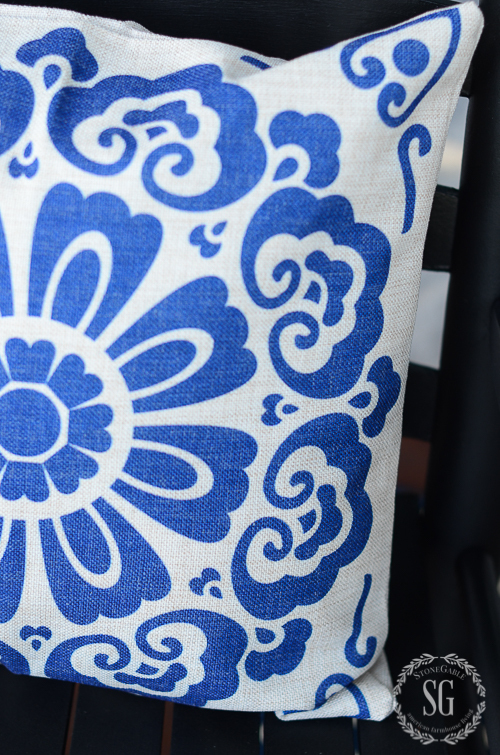 I don’t use much blue and white inside my home anymore, but I’ve kept some of my favorite pieces. And I’m so glad. I love how they look on the porch this year! 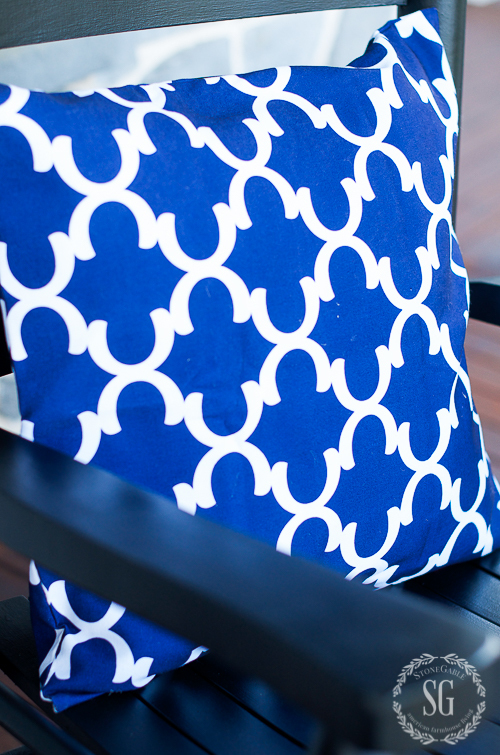 Who knew that these blue and white pieces would look so nice on the porch! I love red and pink together! 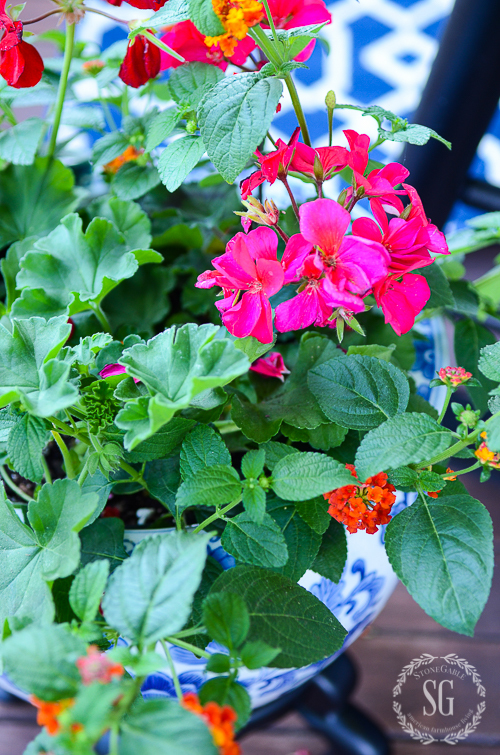 The blooms are planted in a black plastic container so they don’t get waterlogged when I water them. It’s amazing what you can do with a can of spray paint. 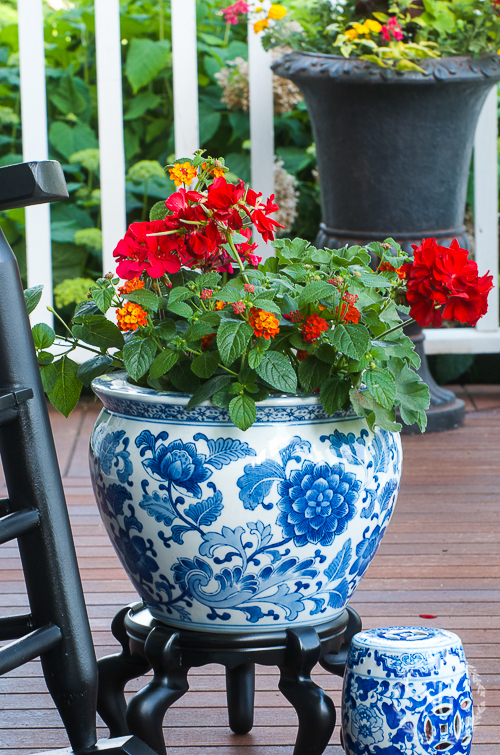 I have loved my grayish blue colored porch rockers. We bought these rockers when we first moved into StoneGable 20 years ago at a local Amish shop. They are so sturdy and have held up so well. I was very ready for a change so I spray painted them a satin finish black. I thought black would add a little drama and work with the blues, pinks, and reds! I put the rockers under a shady tree and gave them 3 light coats of black spray paint. So, so easy. 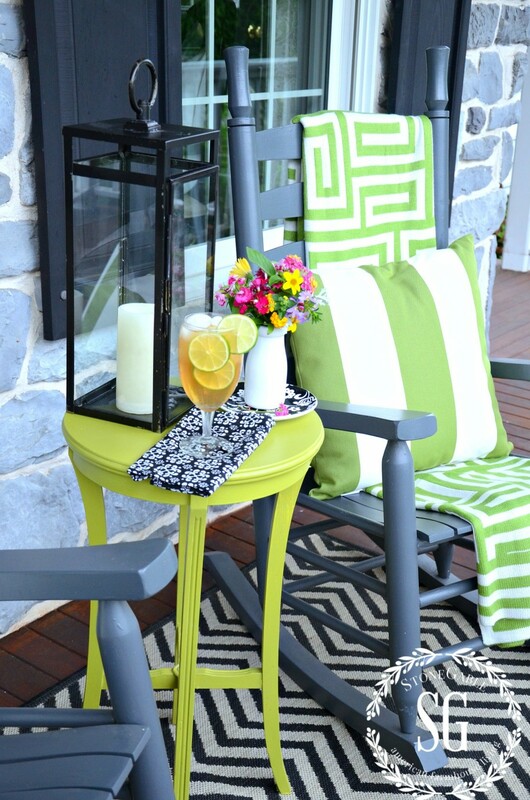 Do you have a piece of furniture you could use outdoors? Does it need a new, spiffy color? Spray paint it! I brought in a low square table that is very sturdy! We get lots of wind when storms whip through so I needed a table that would not blow away! 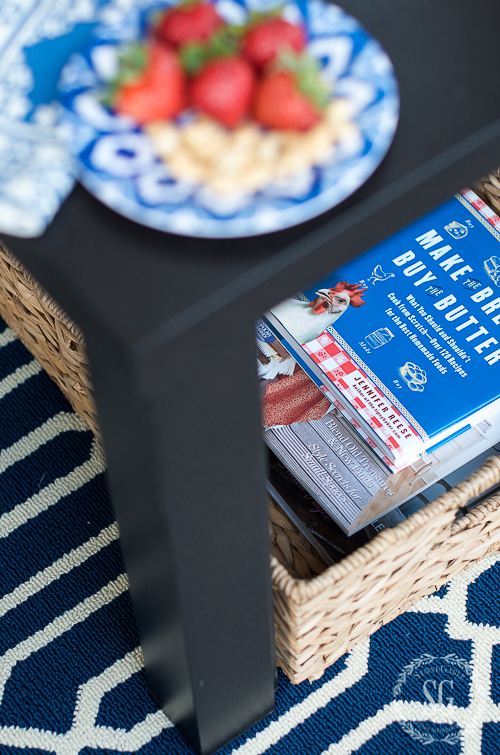 The table is just perfect for scooting a basket filled with magazines and book under it. Give me a yummy drink and a good book or magazine and I’ll rock the evening away! 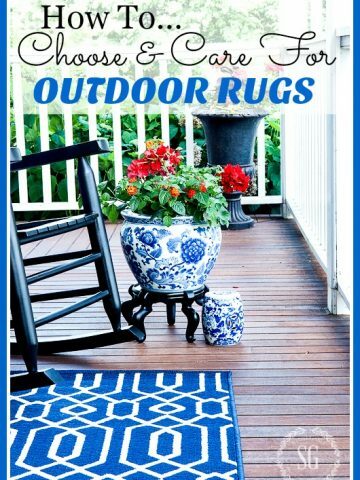 I did get new indoor/outdoor carpets for the front porch (Ballard Designs) in a bold royal blue and white pattern. 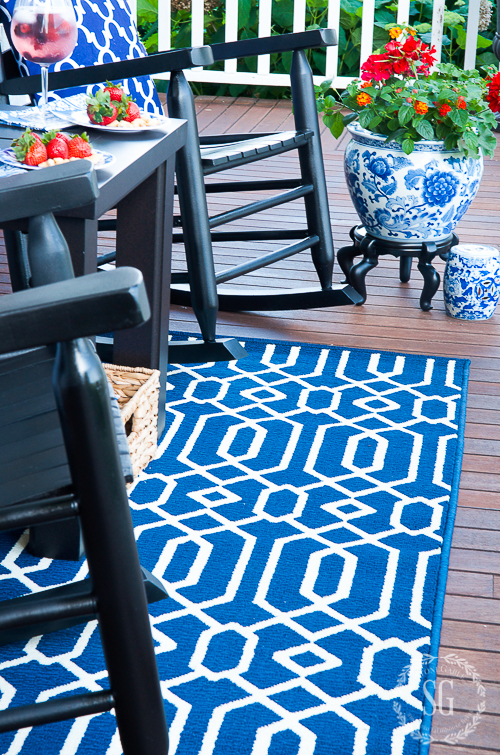 I used the inspiration of the blue and white planter to decide on this color and style of the rug. The black and white indoor/outdoor carpets that have been on my front porch for a few years will go around to the back porch. Another set of rockers will sit on them. I love to be able to reuse what I have! I found these bright pillows from Amazon. Now, let’s do a little porching! 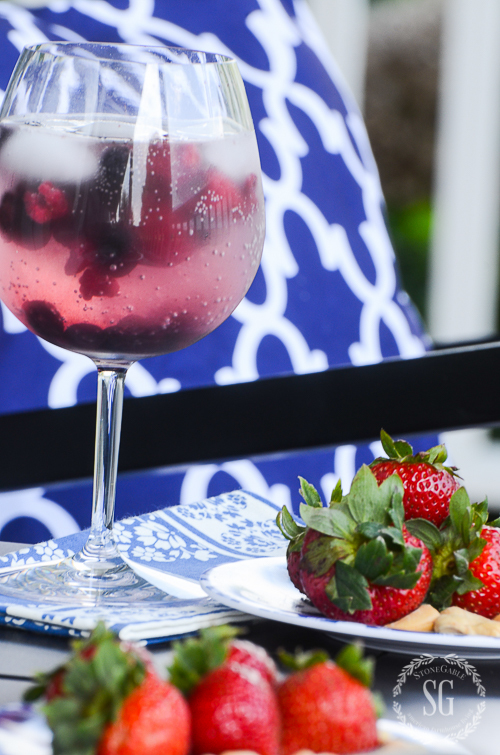 Help yourself to a fresh berry drink and some nibbles… and start rocking! 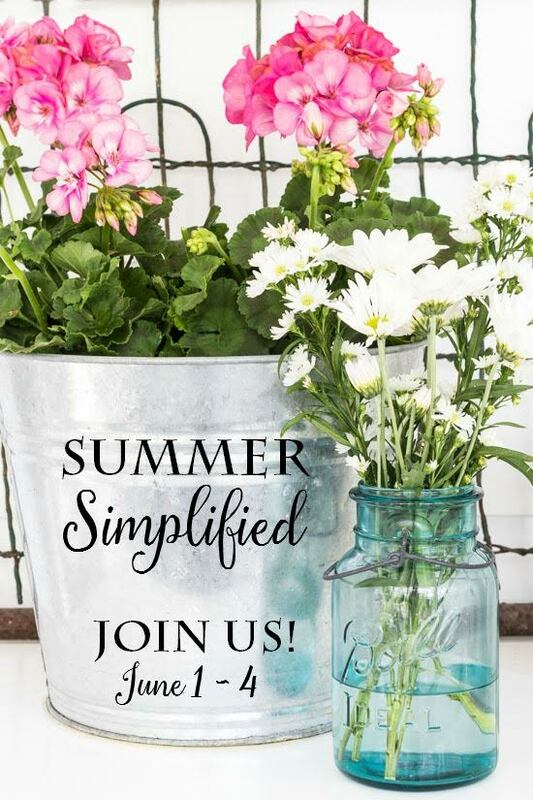 I know you will enjoy the Summer Simplified blog posts below! Would you tell me the color of paint you had on the rockers before the black? I am interested in that color. Thanks. I love your porching vision, Yvonne, both last year and this year’s refresh. Lol, my autocorrecting wanted to call it poaching. Yvonne…this is so utterly charming and the blue is perfect. I could sit and porch all day! It looks so inviting Yvonne! I just want to sit on one of your rocking chairs and chat with you. Love the blue ad white! I assumed you hand painted those rockers. I’m excited to know that spray paint can have such beautiful results. Grew up in a home with a wonderful porch and have fond memories of porching. Just beautiful Yvonne! Love the new combo! Just power washed my porch last week,brought up from he basement some cushions I bought last fall on sale for my chairs and set everything up. I put out some new accessories, filled my planters and I’m ready to porch too! Wow! My porch could use a little power washing too! 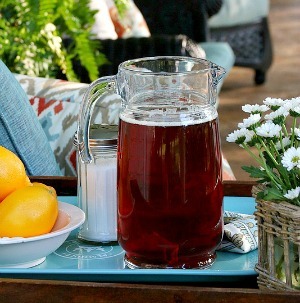 dont mind if i do help myself to a refreshing drink and some snacks as we sit there and chat and rock…chat and rock…. ps- cant wait to hug your neck. Right back at you my dear wonderful friend!!!! Wow! 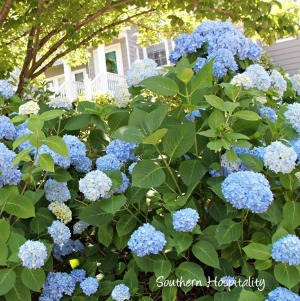 Yvonne,I love your blue and white theme for your porch.As a little girl ,I remember sitting on my Grandma Lane’s front porch. My Grandma’s porch was the neighborhood gathering place on summer evenings, good conversations were had and many happy memories were made. Hope you and your family make many memories on your porch. Does anyone use the old time swing on a porch? I am looking for inspiration! Hi Nan! I have a great swing on my back porch. I’ll do a total porch tour this summer and you will see my swing! So beautiful and welcoming. A great spot to spend a hot summer evening, and proof that the south isnt the only place to do some porch sittin! Yvonne, you have captured my heart! I am a totally blue and white fanatic and I love how you play the bold colours against the ceramics. Simply gorgeous! Crisp and lovely Yvonne…your styling is always top notch! 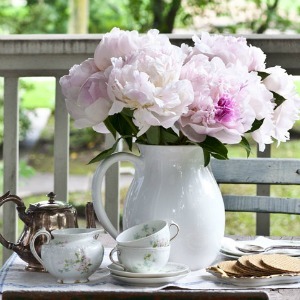 I would love to do some “porching” at your house – I think I could rock myself for hours there – it’s absolutely lovely! Your porch is lovely! I love your pots and the blue and white is so pretty! 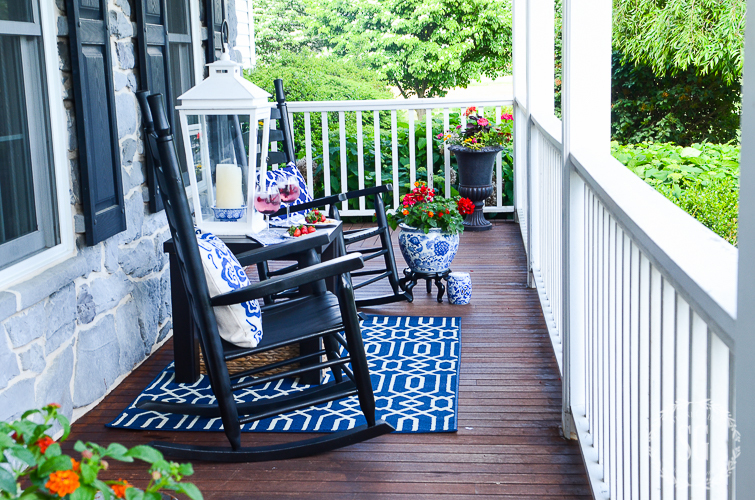 Love the fresh look of your porch and the rockers look SO inviting! I think I’m gonna go porching today! Yvonne, it’s all SO SO pretty! 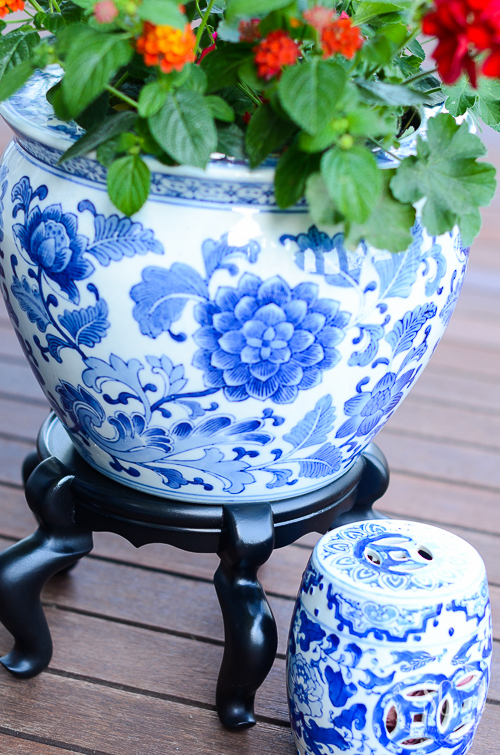 I love blue and white and like how you brought it outdoors to freshen up your spaces. I’m all about the spray paint too! Happy Summer! Thanks, Rhoda! See you at Haven!!! Very beautiful Yvonne…love the cool and crispness of the blue and white! 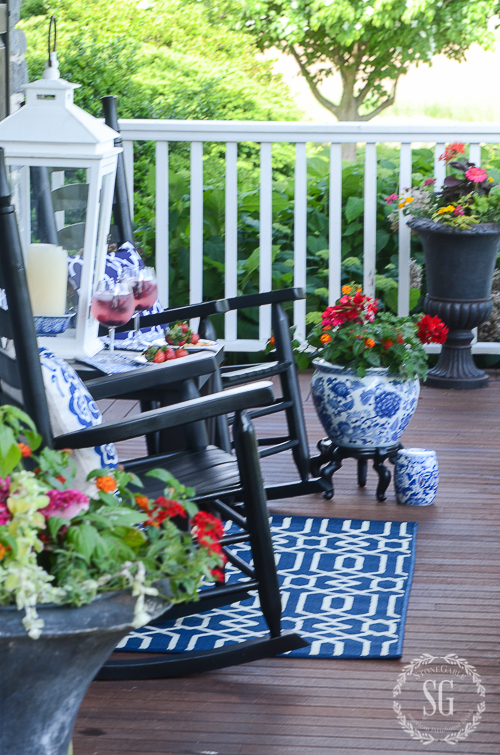 Love your porch. 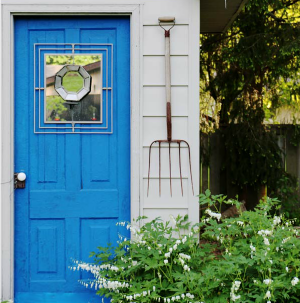 Love your updated porch and fresh colors. 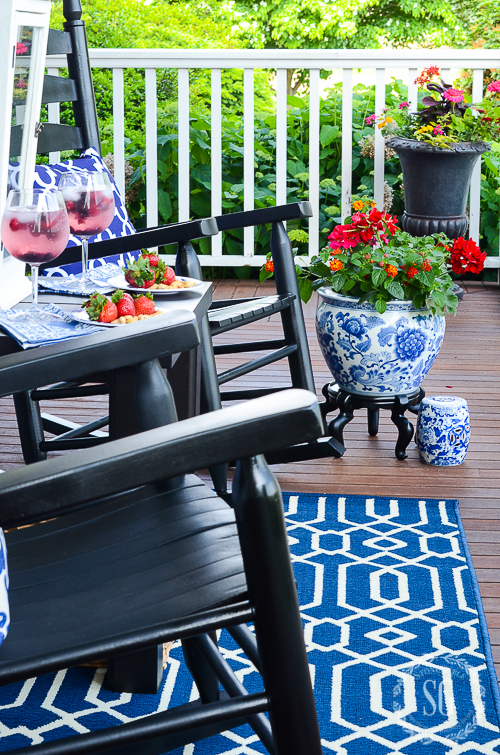 Blue and White with red accents is an all time favorite. Blue + Black is one of my favorite upscale combinations. Love the porch. I wish I had a big blue and white fishbowl hanging out in my basement, first I need a basement. ? Your porch is so inviting, Yvonne! I love blue & white! It’s a classic! Thanks for the inspiration!